On Sunday, February 25, Learning2gether hosted the EVO 2018 annual closing ceremony, where EVO (Electronic Village Online) moderators and participants joined us online to discuss, reflect, and relate their stories about their experience in EVO2018 this January-February. In a break from tradition, this year’s closing ceremony took place the week after the official end of the sessions. We have seen from experience that many of the sessions like to stage their own events around the time of the official end of EVO, and a closing ceremony on Feb 18 interferes with that; hence the choice of Sun, Feb 25. 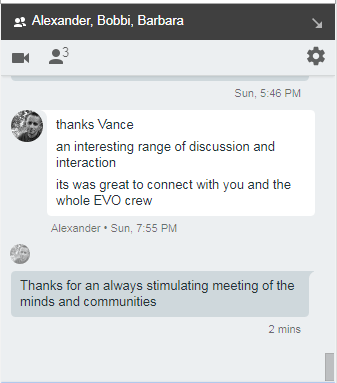 As usual, the session was held in Bb Collaborate and streamed on Vance’s YouTube channel, with opportunities for participants to join us live in BbC or participate in real-time in the YouTube or Chatwing text chats. The video above is the streamed version. It includes some setup while we waited for moderators and participants to get Bb Collaborate working for them and struggle to join us in the session. It seems that Bb Collaborate has become challenging for many to access, so I started the stream in order to be able to talk to people who were gathering in Chatwing, where audience members were able to help one another access the main chat space (or not, as the case might be). At one point we attempted a screen share in Bb Collaborate which I moved off my broadcast stream, resulting in black viewing window for those in the stream until they were able to alert me to the problem. I fixed it by transitioning to an alternate window I had queued in OBS (Open Broadcasting Software). You can go to the venue at any time, days, hours (don’t leave it to minutes) before the event and test your connection, practice, and get help if you need it. If you leave it to the last minute or are truly unable to resolve your connection problems, or simply want to watch on YouTube, you can tune in to the live stream on Vance’s YouTube channel. and finally how to find the recording and extract its share link. Abu Fletcher a.k.a. Don Carroll has been explorer extraordinaire in EVO Minecraft MOOC 2018. He has been finding temples in all kinds of biomes, and has pioneered underwater temple exploration. With community help from Dakota Redstone, who prepares potions for night vision and underwater breathing, we are able to go underwater and negotiate the temples for as long as we are able to avoid the lethal guardians. Don showed me (Vance) this temple before and I resolved to return and video it in OBS. I announced it on our community space and Maha Abdelmoneim and Jane Chien joined us for several rounds of potion so we could explore the temple. At the end of the video I got good shots of Maha (Olivetree_Grove) trying to explore the temple and fighting off guardians until we both ran out of air. Then it was re-spawn on shore for a debrief and drying off after the experience. There is so much to learn about this game with scaffolding help from our active community. If you are whitelisted on our server you can find the temple at /warp om_temple and if you are lucky you might find some potion in the diving supplies chest. If you get hit by a flying jellyfish, you can restore your strength by drinking milk (in the other chest) and then take the two potions for Night Vision and Underwater Breathing one after the other. Then jump in the water and try to avoid the monsters. DON’T drink milk after drinking potion as it will negate the effects of the potions. Please join us for a vibrant discussion all about inquiry-based learning and how teachers can powerfully personalize learning for students in their classrooms. Trevor MacKenzie, author of the best-selling book Dive into Inquiry: Amplify Learning and Empower Student Voice and forthcoming (and highly anticipated) follow-up Inquiry Mindset: Nurturing the Dreams, Wonders and Curiosities of Our Youngest Learners (co-authored with Rebecca Bathurst-Hunt) will share some tips, tricks and processes for teachers both new and well-versed to the inquiry classroom. These takeaways will be a mix of ideas and activities you can do tomorrow in your class as well as BIG ideas that will truly transform your teaching. 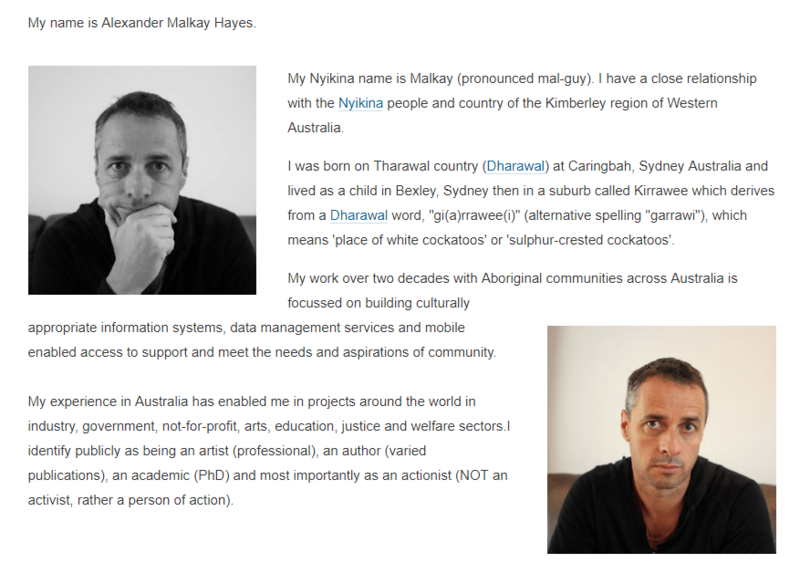 Trevor will also share some exclusive content from Inquiry Mindset during the webinar that hasn’t been released to the public yet – exciting! If you haven’t heard Trevor speak you’re in for a treat – he’s passionate, informed, and an absolute sharer. He genuinely cares about impacting teaching and learning. You don’t want to miss this webinar! Have you seen this Sketchnote? It’s gone viral and will be discussed during the webinar. On the Classroom 2.0 LIVE! site (http://live.classroom20.com you’ll find the recordings and Livebinder from our recent “The World Is My Audience-Book Creator For Student Publishing” session presented by Jon Smith. Click on the Archives and Resources tab. On Thursday, February 22 participants in EVO Minecraft MOOC conducted an underwater exploration on Om_Temple, off an island discovered by Abu Fletcher in Minecraft. Abu Fletcher a.k.a. Don Carroll has been explorer extraordinaire in EVO Minecraft MOOC 2018. He has been finding temples in all kinds of biomes, and has pioneered underwater temple exploration. With community help from Dakota Redstone, who prepares potions for night vision and underwater breathing, we are able to go underwater and negotiate the temples for as long as we are able to avoid the lethal guardians. Don had showed me (Vance) this temple before and I resolved to return and video it in OBS, Open Broadcasting Software. I announced it on our community space and Maha Abdelmoneim and Jane Chien joined us for several rounds of potion so we could explore the temple. At the end of the video I got good shots of Maha (Olivetree_Grove) trying to explore the temple and fighting off guardians until we both ran out of air. After we had all re-spawned on shore, we held a debrief and dried off after the experience. 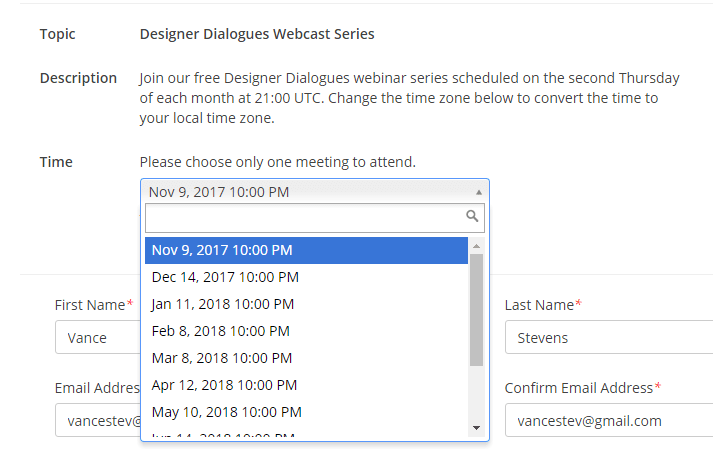 The Designer Dialogues webcast series is scheduled on the second Thursday of each month at 21:00 UTC. Register and see the list of scheduled webcasts. See the 21:00 UTC time zone conversion for your area. Live webcasts are held using the Zoom webinar platform. To help manage the conversation, the live meeting is capped to the first 100 attendees. The recording will be posted here after the session. We are thrilled to welcome back Shelly Sanchez Terrell, one of our favorite presenters and a faithful supporter of Classroom 2.0 LIVE as our special guest presenter this week! Shelly will be inspiring us with her fantastic ideas and resources for using fairy tales in the classroom. Fairy tales are an important part of childhood. Fairy tales excite learners of all ages with the magical elements, mythical creatures, and happily-ever-afters. Fairy tales can be used to inspire various writing activities, introduce students to other cultures, analyze patterns, reflect on universal themes and motifs, and learn about the way people lived in the past. In this presentation, Shelly Sanchez Terrell will share with you the rich history behind fairy tales, lesson ideas, and web tools and apps to have fun with fairy tale characters and plots. These activities are for learners of all ages. Shelly Sanchez Terrell is an international speaker, elearning and digital learning specialist and the author of Hacking Digital Learning Strategies: 10 Ways to Launch EdTech Missions in Your Classroom, The 30 Goals Challenge for Teachers: Small Steps to Transform Your Teaching, and Learning to Go: Lesson Ideas for Teaching with Mobile Devices, Cell Phones and BYOT. She has trained teachers and taught learners in over 20 countries as an invited guest expert by organizations, like UNESCO Bangkok, the Venezuelan-US Embassy, Cultura Inglesa of Brazil, the British Council in Tel Aviv, IATEFL Slovenia, EduTECH Australia, and HUPE Croatia. She has been recognized by the ELTon Awards, The New York Times, NPR, and Microsoft’s Heroes for Education as a leader in the movement of teacher driven professional development as the founder and organizer of various online conferences, Twitter chats, MOOCs, and webinars. Recently, she was named Woman of the Year by the National Association of Professional Women, awarded a Bammy Award as a founder of #Edchat, and named as one of the 10 Most Influential People in EdTech by Tech & Learning. Her latest project is the creation of Edspeakers“> to enrich the field of education with passionate voices (spoken and written) from those of diverse experiences and backgrounds. Shelly has an Honors BA in English with a Minor in Communication and a specialization in Electronic Media from UTSA, a Masters in Curriculum Instruction ESL from the University of Phoenix, and a CELTA from CELT Athens. Her greatest joy is being the mother of Savannah Duncan-Sanchez and Rosco the pug. On the Classroom 2.0 LIVE! site (http://live.classroom20.com you’ll find the recordings and Livebinder from our recent “A New Spin on PD” session presented by Dennine Leschinsky.Click on the Archives and Resources tab. We are thrilled to welcome Jon Smith, an always inspiring, energetic, passionate educator as our special guest presenter for this webinar! We’ve had many presenters who have highlighted Book Creator as a valuable tool to encourage student writing so we are excited to be able to feature an entire webinar on using Book Creator in the classroom! Students today have a global following except in school. Six years ago Jon began writing and publishing books with his special education students. Changing their audience from teacher to world had a profound impact on these students both personally and academically. In this webinar you will learn the story of why Jon began using Book Creator to publish student writing for the world. He will also share ideas for teachers to begin using Book Creator immediately to do the same in their classrooms. 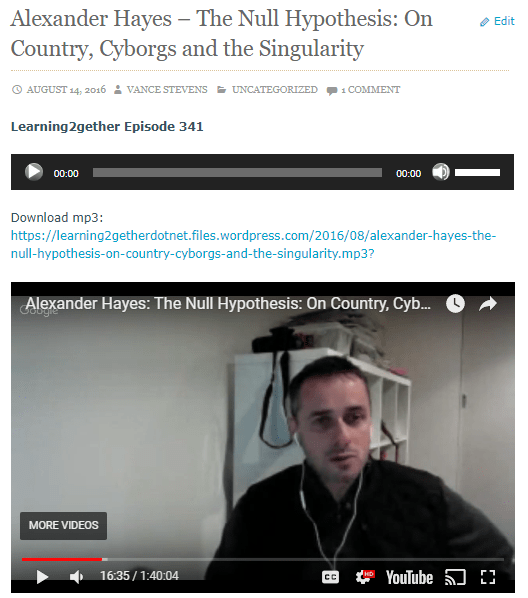 On Feb 4, 2018 Alexander Hayes met with participants in the Electronic Village Online EVO Minecraft MOOC, combined with Learning2gether episode 382. The event was streamed as a YouTube Live Hangout on Air (HoA) and the live link was posted in such a way that Mircea Patrascu, Maha Abdelmoneim, Jo Kay, Jane Chien, and Don Carroll were all able to join in the live discussion in the hangout. 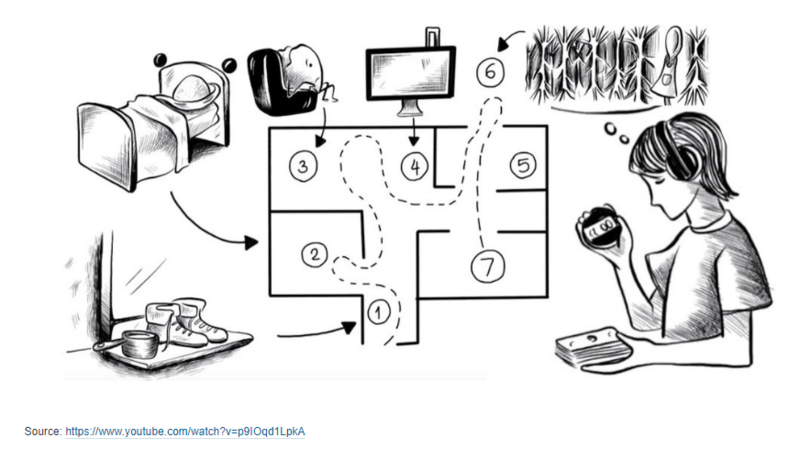 As active agents of sociological change children now challenge the researcher stereotype amidst a battleground of virtual, augmented and mixed reality wearable computing. Fractals once closer to philosophical ramblings of the mathematical in the field of chaos theory are now an educative and neurological rearrangement as STEAM gets creative in Minecraft. A dilemma has emerged as participatory netnography reveals the longer term socio-ethical effects of corporations punching through our privacy firewalls, programming our minds and harvesting our creativity. (Vance is not able to select text in his Chrome browser, Windows 10, in order to copy it, and FF, which does allow me to select and copy text, was refusing yesterday to run HoA until Google fixed an issue with Hangouts). 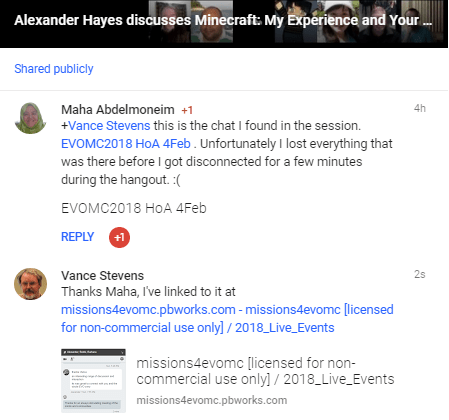 Meanwhile EVO Minecraft MOOC arranged playdates on the server on Feb 6 and 7. Jane Chien, Mattie Tsai, and Don Carroll produced the following videos.